The market faced a number of headwinds in May – seasonality (“sell in May and go away”), the Presidential Election Cycle (now in its second year where since 1934 the average decline has been 21%) and an aging bull market (more than 5 years old; not many have lasted as long). Traders couldn’t be blamed for thinking that the extremist takeover of Iraq, one of the world’s largest oil producers, which started about three weeks ago might be a catalyst for a market correction. However, instead of rushing for the exit doors investors continued to pour money into US equities in June, especially the stock of small- and mid-cap companies. 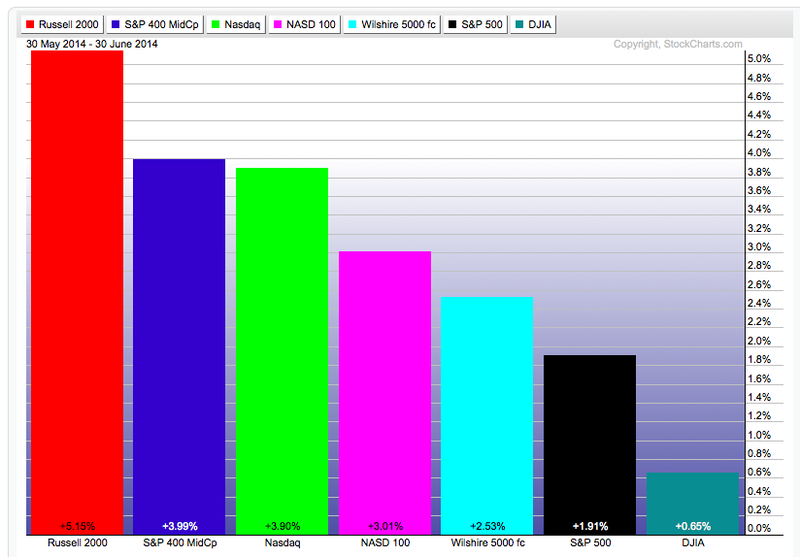 The market averages we track gained between 5.2% for the Russell 2000 and 0.7% for the Dow Industrial Average. My newsletter runs timing models for the benchmarks charted above – all remained on buy signals throughout June. Each day that Wall Street is open for business I monitor benchmarks for 18 different markets to gauge relative strength. The results help me to identify regions of the world or categories of US stocks currently exhibiting positive momentum. The ranking is derived by applying a proprietary formula which incorporates performance over a variety of time periods, with more weight given to recent price activity. This is just one of many filters I use in determining newsletter model portfolio and managed account client recommendations.